Summary: Sydney is living in an idyllic bubble—she's a dedicated student with a steady job on the side. She lives with her best friend, has a great boyfriend, and the music coming from the balcony opposite hers is fast becoming the soundtrack to her life. But when Sydney finds out her boyfriend is cheating on her, the bubble bursts. The mysterious and attractive man behind the music, Ridge, gives Sydney hope that she can move on and they begin to write songs together. But moving on is harder than she expects, Sydney can only hope…. Colleen Hoover does it yet again with the heart ache. Like my heart physically aches when I read her books. I get so invested in everything she writes that, at most, it'll take me a day and a half to finish one of her books. This book is a perfect example of wanting what you can't have. Ridge and Sydney, basically from the moment they meet, have an undeniable attraction towards each other, but they have to hold back. Sydney just found out that her boyfriend of 2 years is cheating on her with her best friend, she lost her job, and now has no where to live. Ridge lives in the same apartment building and invites Sydney to stay with him. Together they write music and as Sydney begins to move on, she realizes her and Ridge have more than just innocent feelings for each other. But there's one thing stopping them from being together, Ridge has a girlfriend. Now both of them are trying to fight these feelings for each other and Sydney is desperately trying not to turn into her best friend. I loved loved loved this book. Seeing Ridge and Sydney fighting there feelings for each other, I honestly thought they weren't going to be able to hold back. Also the way they worked together, they just instantly clicked. With everything going on in each of their lives, all the secrets and drama, they were able to stay grounded. Please tell me I wasn't the only one who was completely shocked that Ridge was deaf? Like I was literally so confused. He just came out and said it so bluntly that I didn't really believe him at first. Honestly, if I were Sydney I don't think I would have been able to just slide right into that. She just found it so normal right away. I loved that they were so comfortable with each other so fast. Ridge automatically expected Sydney to just know everything about him as if they had known each other for years. Especially when it came to them writing music together, it's just like they knew exactly what to do and when to do it. Also the fact that Ridge is telling Sydney stories from his childhood that he hasn't even told Maggie, his girlfriend. Towards the end, when Maggie ends up in the hospital, Sydney is still there to support both of them. Even after Ridge tells her she needs to move out. Okay, lets just take a moment to discuss Ridge speaking for the first time. Just the fact the he spoke to Sydney and said "I will never regret this" had me in tears. Ridge hasn't spoke out loud since he was 9 so you can't tell me he's not madly in love with Sydney! That moment just made me so happy. This book had me laughing, crying, and swooning just like all CoHo books. Give anything and everything by her a chance. 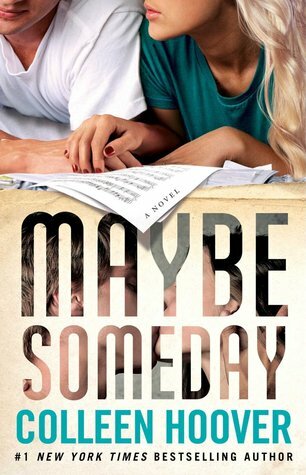 If you've read this book or anything else by Colleen Hoover let us know your opinions!